Please don’t just trust any shop to work on your hybrid vehicle. Not all shops have attained the extensive training that Larson’s Service of Peabody has. Just by adding a few extra ounces of oil during an oil change or towing your hybrid vehicle wrong could have lasting and devistating effects on the future performance of your vehicle.. 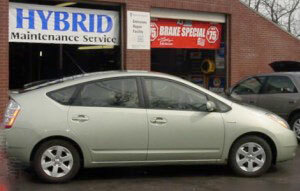 Please feel free to contact us should you have any additional questions about your hybrid vehicle. We have the expertise to make sure you get the most of your Hybrid investment.